Michael Mountain: Have you had a personal change of heart in terms of pit bulls since you began reporting on the Michael Vick case? Jim Gorant: Absolutely. All I knew about them was what you see in the headlines – that they’re aggressive, fighting dogs who are impossible to stop once they start to attack something, and that they were very scary. Part of what made the book powerful was the fact that I was not coming at it from one side or the other. I was trying to figure out what is the deal with these dogs and what’s the truth about them. And what I discovered in the end was that they’re just dogs. The people who wrote these letters were in a distinct minority. Most people had been shocked and appalled by the Vick case. So what was it, Gorant wondered, that had so horrified most people … and left others completely unmoved? Why, also, were people so polarized in their attitudes to pit bulls? Why did these dogs inspire so much love in some people and so much fear in others? And what about the dogs themselves? What had been the outcome for them? The questions led Gorant to travel the country, to meet the people who’d been involved in the case and in the rescue groups that cared for the dogs, as well as the dogs themselves and the people who were now adopting them. The result was the best-selling book The Lost Dogs. A new edition, including updates and an afterword, has just been published by Gotham Books. I talked with Gorant about it. Michael Mountain: I’ve seen most of the interviews Michael Vick has given, and to the best of my knowledge he has still never spelled out what he did to those dogs. On the famous 60 Minutes interview, the most he says is “I wasn’t a leader. I didn’t step up.” Like he’d been sitting upstairs and failed to come down and tell all those bad people in the backyard to stop doing what they were doing. Jim Gorant: I think you do see some generalities like, “I did things I shouldn’t have been doing,” or “I did things that were not appropriate.” But in terms of spelling out, no I haven’t seen that. I’d love to see him dedicating himself to being part of the solution. In Washington, D.C., he did say, “I want to be part of the solution. I want to help solve this problem,” which was the first time I’d ever heard him say something like that. J.G. : I tried to make the point in the Afterword to the book that if the animal welfare community harps on how easy he got off, all it does is make the point that he got off easy. Obviously he was a celebrity, so it wasn’t the same as it’d be for you or me, but I’m in no rush to spend 19 months in Leavenworth. So, rather than continue to reiterate that he got off easy, let’s talk about what he did lose, like a $130-million contract. Sure, he just signed a new $100 million contract, but he lost probably the best three years of his career. How much more would he have made? How much has he given up? And out of that contract he just signed, only $40 million of that is guaranteed, and roughly $20 million of that goes immediately to pay off his creditors. M.M. : In one of the last interviews I saw with him, he was talking about how much he wanted to be able to get a dog as a pet. J.G. : I thought he was banned for life from owning a dog, but I guess it’s only for a couple of years. But I’ve never interviewed him, so I try to shy away from characterizing what’s going on inside his mind. All I can do is hope that if that day comes, he truly is prepared to treat a dog how one should be treated. M.M. : You’ve been out to the property there, and it’s now occupied by Tami Thayne and her Dogs Deserve Better group. I’ve wondered whether, since dogs have such a good sense of smell and other senses, whether that property could ever overcome the scent of fear and all the horror. J.G. : I know that they cut down tons of trees, and they pulled out all those sheds and the concrete kennel with maybe 15 to 20 stalls and chain link fencing and so on. And every time it rains and snows everything gets washed over, so I can’t imagine there would be any remnants left on that. I think it’s a great wrap-up to the story – sort of like justice that this place ends up being, hopefully, a helpful place for dogs. M.M. : When I saw the dogs arriving at Best Friends Animal Sanctuary and the first ones started coming out of the crates, the first one I saw looked like a small Boston terrier rather than a pit bull! J.G. : Well, he had a wide range of breeds there. He had Staffordshire bull terriers and pit bull terriers and a lot of crossovers. It was a hodgepodge and that’s why some people say that as a breeder and as a dog fighter, he clearly didn’t know what he was doing. M.M. : When you think of the dogs today, are there any who really stand out for you in in terms of how they’ve changed? J.G. : Mostly the ones that I wrote a lot about like Jasmine and Jonny Justice. I’m still in touch with their folks quite a bit. And Hector. I’ve spent time with Hector. I’ve done a lot of appearances with Hector, so I got to know him much better. But also the ones who aren’t doing anything special but are just leading a happy normal life. That seemed so distant at one point and it’s great that they can have whatever their version of joy is. M.M. : Who stands out to you in terms of how far they’ve come? J.G. : I just heard that Little Red passed her Canine Good Citizen test. That’s quite startling in that the book really details how much she struggled with fear and not being comfortable around people. Talking to the people who worked with her on a daily basis, I never thought she would get there. I thought she was such a great dog, and she’d come such a long way but that she’d never take final step she needed to be able to be adopted. But wow, they do just continue to build and grow and that’s awesome. M.M. : And the challenges weren’t all to do with behavior. You write quite a bit about their health problems, especially babesia. Lucas, who’d been one of Vick’s prize fighters, sometimes had to be rushed into special care in the middle of the night. J.G. : That’s almost always something with dogs who have been fought. They really faced these sort of hardships and awful lives. But I think the veterinarians found a good mix of medications that are keeping them healthy now. M.M. : Over the couple of years after Vick was arrested, it seemed to me that people were considerably more sympathetic toward pit bulls, but also no less afraid of them – perhaps even more afraid because of all the stories. JG: In the time I spent with the dogs, I met people who were flat out afraid of them, and I met people who came up and started petting them like any other dog, not realizing that they were pit bulls at all, let alone pit bulls from Michael Vick’s house. And when they found that out, it was interesting to see their reaction. If I had to guess, I would say this is the first time these kinds of dogs have been looked at as victims in this sort of crime. I do think there’s probably more sympathy, but whether or not that’s translated into higher adoption rates, I can’t say. I’ve been told that there more dogfighting crimes have been reported. But I think what it actually indicates is that people have been reporting it more instead of turning a blind eye. M.M. 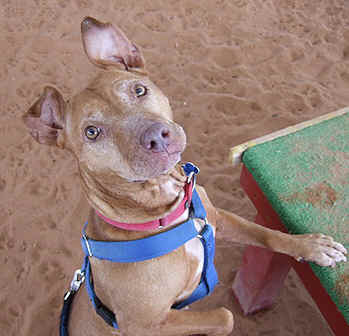 : If people who have read your book ask you whether they should get a pit bull as a pet, what do you tell them? J.G. : I say that they’re just like any other dog. One of the messages of the book is that every dog is an individual. So whether it’s a Labrador retriever or a pit bull or a Chihuahua or whatever it is, you know, approach each dog as an individual. Don’t make any assumptions. I also tell people to be aware of what the signals are to look out for – like what means friendly and what doesn’t, and what’s a warning. But I tell them not necessarily to be more afraid of a pit bull than any other dog. I’ve met tons of people who have pit bulls as pets, and they say they’ll never ever have any other type of dog. They’re so sweet and lovable and they can’t believe they have the reputation they do. Every dog is an individual, so just approach them that way. M.M. 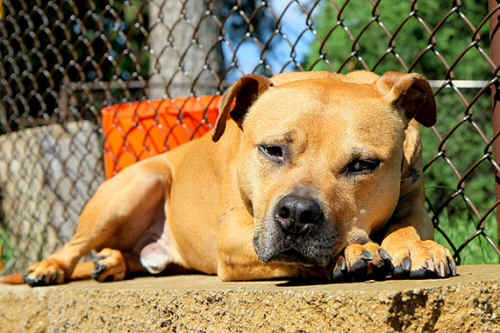 : What about the fact that there are so many stories of people being hurt by pit bulls? There was one just recently about a woman being mauled by her five pit bulls. J.G. : [As a reporter], the first thing I want to know is, exactly what was the situation. First of all, what was she doing living alone with five pit bulls? And with five dogs, you’ve got a pack, and you’ve got to be a pretty good dog person to have five of any kind of dog. How were these dogs kept? How were they trained? Were they properly socialized? I mean, there are a million questions that come into any of these things. When I hear about these things, I want to know all of the details, including what types of dog they actually are, because much of the time they’re misidentified, too. Lots of people get bit by dogs, but it’s only news when it’s a pit bull. M.M. 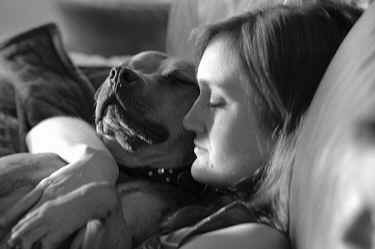 : As soon as I see “Woman mauled by her five pit bulls,” I start to wonder all those things. J.G. : It raises a red flag about the situation, not about the dogs, necessarily, but what was going on in that house. M.M. : Have you had a personal change of heart in terms of pit bulls since you began reporting on the Michael Vick case? J.G. : Absolutely. All I knew about them was what you see in the headlines – that they’re aggressive, fighting dogs who are impossible to stop once they start to attack something, and that they were very scary. Part of what made the book powerful was the fact that I was not coming at it from one side or the other. I was trying to figure out what is the deal with these dogs and what’s the truth about them. And what I discovered in the end was that they’re just dogs. Yeah, they’re big and they’re strong and they’re generally high-energy dogs, and they’re probably better for people who know what they’re doing and have had dogs before and know how to train a dog and walk a dog and socialize a dog. But at the end of the day, they’re just dogs, you know, and each one is an individual. M.M. : What do you tell people who have pit bulls and who feel other people look at them a bit warily because they have pit bulls. J.G. : You know, every pit bull that passes through the world as a good citizen, that’s a dog who changes people’s minds. Just by being [good pit bull guardians], they’re part of the solution and they’re helping to turn the tide. MM: Any especially funny stories from meeting the dogs you wrote about? J.G. : Well, I was visiting the folks who adopted Hector. And they have a pretty large crate to keep him in when they have to go out because they have multiple dogs. So we’d gone out and Roo (his name is Andrew but he goes by Roo) had left a leather leash hanging on the corner of the crate by mistake. So when they came home, there was just the brass from his clip and buckle on the ground. And Hector had eaten the entire leather leash. He puked it up the next morning. It was one of those funny dog stories like Marley does [in the movie]. Hector had a tough morning the next day, but he was fine and it was just one of those dog moments.